Be the first to share your favorite memory, photo or story of Margaret Ann. This memorial page is dedicated for family, friends and future generations to celebrate the life of their loved one. 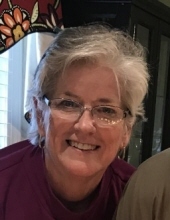 Margaret Ann Parker Parvin, 64, Mount Olive resident and business owner, passed away unexpectedly Monday evening, March 25. Her life will be remembered in a service to be held Friday, March 29, at 11 a.m. at First Baptist Church of Mount Olive, officiated by Dr. Dennis Atwood, followed by burial in the Martin-Price Cemetery. Visitation will be at Tyndall Funeral Home on Thursday, March 28, from 6 until 8 p.m., and at other times, the family welcomes all to the residence. Expressions of love and sympathy through flowers are welcome, or memorial gifts may be made to the Margaret E. Martin Scholarship Fund at First Baptist Church, PO Box 203, Mount Olive, NC 28365, or to the Martin-Price Family Cemetery, in care of Preston Parker, 501 West Main Street, Mount Olive, NC 28365. Margaret Ann, born and raised in Mount Olive, studied Fashion Merchandising and Design at Meredith College from which she graduated in 1975. She was employed with Miller and Rhoads in Richmond, VA prior to her coming home to Mount Olive in 1977. She became employed with Weil’s Department Store in Goldsboro where she was General Merchandise Manager and later promoted to Store Manager. Upon returning to Mount Olive in 1977, Margaret Ann married DeWayne Parvin. Together they decided to continue the endeavors of W. P. Martin Store, her grandfather’s business, originally established in 1910. While DeWayne carried on this family legacy, in 1986, Margaret Ann founded Especially For You, a shop of gifts and accessories. She worked closely with many families to help them design and decorate their homes, each with a special touch. She was a successful pillar within the community and went on to open a second store location in Goldsboro in 2017. After 33 years, the business has continued to thrive due to her motivation and attention to detail. She appreciated her customers and their loyalty. Margaret Ann was a long standing member of the Board of Directors at Mount Olive Pickle Company, serving for 24 years, and was only the second woman to serve in this capacity. Her greatest love was her family where she was wife, mother, mimi, sister, and aunt. She also had a deep love for her church, First Baptist in Mount Olive, spending time at the beach, nurturing pretty flowers, helping others find just the right gift, and giving back to her community. Margaret Ann is survived by her husband, James DeWayne Parvin, of the home; three daughters, Natalie P. Griffith and husband, Benjamin, of Mount Pleasant, SC, Ashley P. Daniels and husband, Donnie, of Greenville, and Bridget P. Soistman of Mount Olive; eight grandchildren, Sara Beth Daniels, Martin Jackson, Caroline Griffith, Charlotte Daniels, Laura Catherine Griffith, Sebastian Daniels, Luke Soistman, and Noah Soistman; a brother and sister-in-law, Preston and Jennifer Parker of Mount Olive; a nephew, Wesley Parker and wife, Michele, of Goldsboro; a niece, Kelly P. Campbell and husband, Chase, of Clayton; and other family and friends. To send flowers or a remembrance gift to the family of Margaret Ann Parker Parvin, please visit our Tribute Store. "Email Address" would like to share the life celebration of Margaret Ann Parker Parvin. Click on the "link" to go to share a favorite memory or leave a condolence message for the family.